“Free and Independent Artsakh Welcomes You” (Ազատ Արցախը Ողջունում է Ձեզ). This simple sentence on a sign that greets visitors entering Artsakh speaks volumes about the endurance, resilience, humility and strength of the people of Nagorno-Karabakh Republic. It also embodies the heroism and perseverance of the men and women who took up arms to defend this historic and crucially vital morsel of Armenian territory that has become a symbol of our national liberation struggle and has emerged as the pride of the Armenian Nation. After all, what has become a complex geopolitical conflict impacting nations and engaging superpowers, emerged from the simple concept of a people’s desire to determine for themselves their own fate and to live freely on their own historic land. That is why as we mark the 24th anniversary of Artsakh’s independence we must realize that there is no turning back and there is no other option for Artsakh except independence. Having endured unspeakable and unfathomable hardship, the people of Artsakh rose to the challenge and together—hand in hand—rebuilt the country from the ashes of war and restored it to its former glory and beyond, carving out a republic that is not only free and independent but truly a model for democracy in a region marred by post-Soviet corruption and continued threats of war by an aggressor that has not been able to come to terms with its humiliating loss. While walking in Artsakh—be that in Stepanakert or Shoushi or any of the myriad majestic and historic places—all one has to do is look at a child, whose smile projects hope for a bright future and whose eyes reflect the resilience of an ancient nation that is not afraid to fight for its rights and stand up for justice. So, to all those, whether they are envoys of the United States or the despotic dictator of Azerbaijan, who have made a habit of regularly and vociferously calling on Artsakh to cede territory, we say: NOT ONE CENTIMETER of land that has been won by the blood of our brethren will be surrendered. 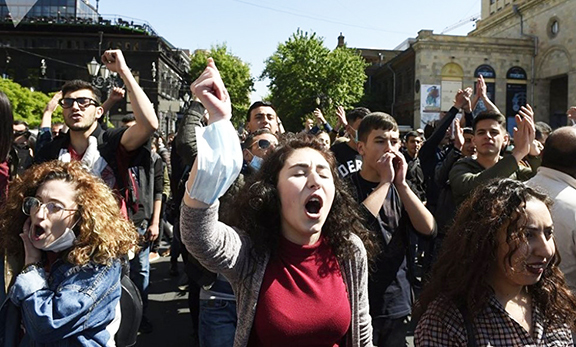 Now, almost a quarter of a century after Artsakh’s independence, every country must recognize the Nagorno-Karabakh Republic and Azerbaijan must cut its losses and finally admit defeat. Only the de jure inclusion of Artsakh in the international community of nations can guarantee peace and stability in the region and ensure vitality and hope for a strong Artsakh. You said it right bravo. Long live free and independent Artsakh. Not an inch of land not a centimeter of our liberated Holy Land will be given to anybody. Do not trust James Warlick or anybody on this earth. Enough of fake smiles and hand shaking at the expense of Armenian lives. We have already given enough blood to the Genocidal and blood thirsty Turks and enough is enough Mr. Warlick and every one else in this so called OSCE group, just pack up and go to your families, we just do not need you to mess up our peace. Every time Odars negociated for Armenia, Armenia lost big.